There's a bit difference between espousing things you don't believe in (see: Romney) and using your elected office as a pulpit to support your criminal deeds. If you think this is normal behavior, you are too cynical about politicians. Most manage to do unethical things within the bounds of the law. 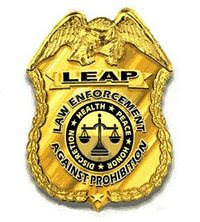 Even though Drug Traffickers for Prohibition might serve as a good counterweight to Law Enforcement again Prohibition, seriously, this goes beyond the pale.